Due to Jonah Center action, commercial trapping of Snapping Turtles is now at least regulated by the CT DEEP. Prior to this action, commercial trapping of these ancient creatures was unrestricted in terms of limits, season, or methods. Now, the season is only from July 15 through September 30. 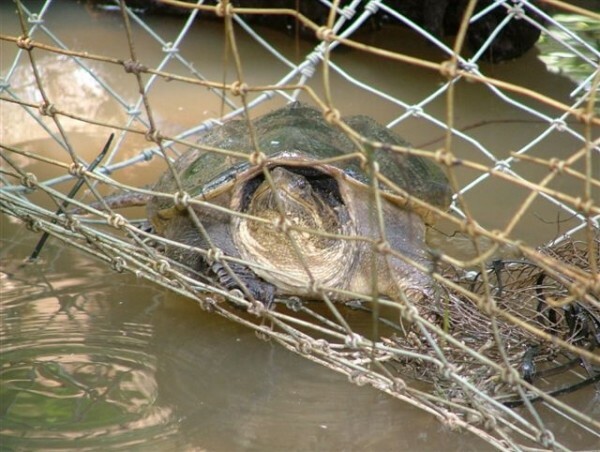 The traps must be at least partly above water at all times to allow turtles to breathe, must have a 7.5″ escape hatch for small turtles, and the wire mesh must not be narrower than 1 inch. A numbered tag (4 or 6 digits, identifying the license holder) must be visible above the water. When you are out paddling on the “Floating Meadows” or any other Connecticut waterway, please look for snapping turtle traps and take a photo, using location services so that geographical coordinates are recorded, and let the Jonah Center know of your siting. Email us your photo. If there is no number of the trap, or if you believe it is an illegal trap for any reason, or if it is out of season, please call the CT DEEP Dispatch Center for Enforcement at 860-424-3333 immediately. 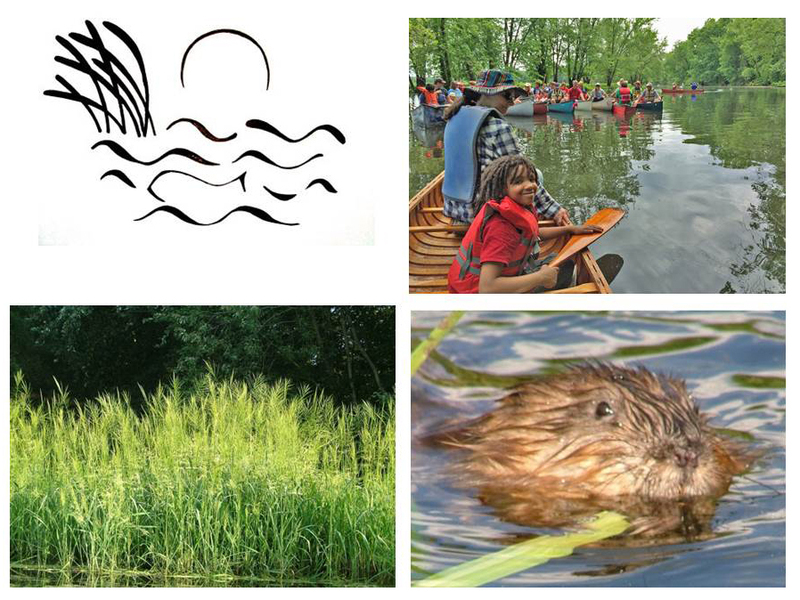 Sunset Paddle in the Floating Meadows — Aug. 22, 5 p.m. The Jonah Center invites kayakers and canoeists to paddle the Floating Meadows on Saturday, August 22, from 5 to 7:30 p.m., ending at sunset. We will follow the Mattabesset River upstream, assisted by an incoming tide, and view the 1000 acre marshland’s bright green wild rice grass in late afternoon light at the most spectacular time of year. Redwing blackbirds and swallows will likely be very active, with a half-moon high in the sky. The outing will start and finish at the new Phil Salafia Canoe and Kayak Launch at 181 Johnson Street in Middletown’s North End (next to the recycling center). Paddlers need to provide their own boats, lifejackets, water and snacks (if desired). Pre-registration is not required, but participants will be asked to sign a liability waiver and photo use permission slip. The Jonah Center requests a donation of $10 for each participant. For more information, contact John Hall at 860-398-3771. In the meantime, the Complete Streets Committee was asked to define points where the city’s Complete Streets Master Plan converged with upcoming road bond projects and planned improvements to City parks. The Committee is very busy with that work. In Portland, the Complete Streets Group is developing a draft Complete Streets Master Plan for the town, so that this Plan can be referenced in Portland’s new Plan of Conservation and Development that is being developed. The NEAT Hiking Club sponsors chaperoned hikes for young hikers living in the North End of Middletown. All young hikers with any level of hiking experience are welcome to join our hikes. Other young hikers from the community are welcome to participate when space is available. Hiking trips generally last between 3-4 hours and are mostly within Middletown or the surrounding communities. Hikes are scheduled on Saturday or Sunday mornings and are generally finished by 12-1:00. Hikers should be between the ages of 8-17 and must be wearing suitable outdoor hiking clothes and shoes. Parents are welcome to accompany their children on hikes. To download the event flyer with more information, click here. Our next hikes are on August 1 and August 15. Call the North End Action Team (NEAT) at 860-346-4845 or stop by the NEAT office to sign up for the hike and to get additional information about the hike. More information is available by calling 860-346-4845. A proposed “Complete Streets Ordinance” is on the agenda of the City of Middletown’s Public Works and Facilities Commission meeting on Wednesday, July 8, at 7 p.m. in Room 208 of the Municipal Building, 245 deKoven Drive in Middletown. The purpose of the ordinance is to help Middletown become a more bike- and pedestrian-friendly community by ensuring that the needs of all users – pedestrians, bicyclists, and public transit users – will be considered in planning all future transportation improvements. Middletown’s Complete Streets Committee, established in early 2012 by Mayor Drew and chaired by the Jonah Center, developed a Complete Streets Master Plan by early 2013. This master plan was incorporated into the City’s Plan of Conservation and Development in 2014. The master plan defines key streets, highways, school zones, and commercial areas where additional sidewalks, crosswalks, bicycle lanes, and off-road trails would be most helpful in connecting various parts of the city for users of non-motorized transportation. The draft Complete Streets Ordinance under consideration will help our community seize every opportunity to make key bike-ped improvements while other infrastructure improvements are being planned. A show of public support at the July 8 meeting will help ensure endorsement of this Complete Streets Ordinance by the Public Works and Facilities Commission, so that the ordinance can move on to the General Counsel Commission and eventually to the Common Council. Please plan to attend if you are able. For more information, contact John Hall at 860-398-3771 or send a message from our home page.